This tool will help us to create a large dictionary file which will later be used to crack many hash types such as the ones stated above. I used these tables to crack some passwords on my lab using rcrack. A Windows 7 or later machine. One thing you must remember, you must be aware to the large hard disk consumption that the tool generated. 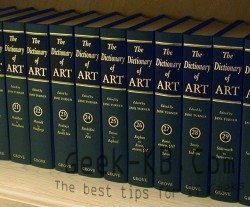 If you intend to create a huge dictionary which contains alphanumeric, space, characters, Take into consideration that the table may reach size of 5gb. Hash types – The type of hash you’re going to generate tables for. fastlm: LanManager hash. Same as lm but optimized for MMX instruction; It’s faster than “lm” in both in generation and cryptanalysis on P4 Centrino (or superior) processors. Not compatible with rcrack. ntlm: NTLanManager hash. A newer hash for M$ authentication, and the only one you’ll find in the belly of a PC that has some serious security setup. Password are not converted in 7 uppercase chars chunks. lmchall: used to attack the sniffed (not dumped!) LM authentication as a whole. Requires the challenge to be poisoned to a corresponding value. Unconvenient: better to use halflmchall and go brute with the remaining chars. halflmchall: used to attack the first 7 chars of a sniffed (not dumped!) LM authentication. Requires the challenge to be poisoned to a corresponding value. Using halflmchall + brute is always better than pure lmchall. ntlmchall: used to attack the sniffed (not dumped!) ntlm authentication. Requires the challenge to be poisoned to a corresponding value. Similar to lmchall, but there can be no “halfntlmchall” so you get to go with it. mscache: used to attack the cached credentials of the previously logged users. Requires each tableset to be generated for a specific username. The proposed value: “Administrator” is possibly the most interesting in many cases. 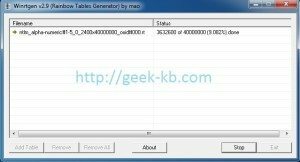 oracle: oracle hashes – Requires each tableset to be generated for a specific user name. wpa-psk: wpa-psk hashes. Requires each tableset to be generated for a specific ESSID. Unlike Oracle not all wlans use the proposed ESSID (“wlan”) as default. Min len / Max len: The minimun and maximum length of the included passwords. This is the first of the two parameters that define the keyspace. Note that raising the min value usually lowers the keyspace by a negligible amount. 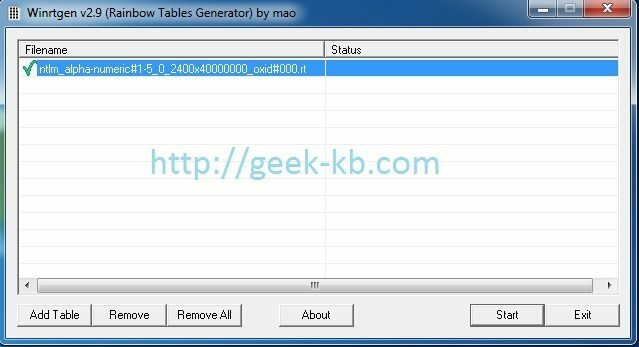 Index: The tables discriminator. It Is very important to understand this: the table index and _not_ the file number gives you the identity of a table. Multiple files sharing the same index pertain to the same table. Chain len (or “t” parameter): The number of hashes represented by a single chain. A chain always uses the space of two hashes (the first and the last) on disk. This is one of the parameters that define the keyspace coverage. Chain count (or “m”/”N°of tables”): The number of chains in a file. This is one of the parameters which define the keyspace coverage. Too much (and too long, see previous point) chains in a single table produce merging chains and wastes. Charset: defines what characters will be used in the randomly-chosen plaintext to hash (ok, the passwords ). This is the second of the two parameters which define the keyspace. You can edit the file manually or by clicking on the “edit” button. The file is also used for charset selection by the bruteforcing engine. 4. When you finish setting up all of the properties, just click OK, and in the main program click OK once again to start build the tables. You can leave your computer and go out or something because it’s a very long process. It took about 6 hours to complete the process. Have fun and feel free to leave comments!